Troy, an amazing GNI associate, is leaving us to follow his dreams of helping serve others overseas. Dad and I are blessed to have amazing associates work with us over the years. 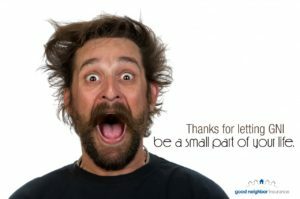 Dad (Jeff Gulleson) founded Good Neighbor Insurance in 1997 to help serve and protect travelers, expatriates and groups using his professional and overseas experience to help them get the best insurance and keep them safe. As the co-owner of GNI with Dad, I get to enjoy living out our mission statement each and every day! But Dad and I could never do this on our own. Especially as we have grown and people have spread the word about our service and work ethic! We now have 11 top-of-the-line associates and agents making our GNI mission statement shine each and every day. Most of our associates have lived and worked overseas and Troy is now following in their footsteps! As a young man in his early 20s, Troy has realized that traveling and living overseas is an area he wants to personally experience. That happens when you hear stories of people doing extraordinary things, in amazing places, almost daily. Imagine that! We are so very thankful Troy came to us almost two years ago to work alongside our GNI Team. Troy will be greatly missed for sure! His joyful spirit, his hard work, and love for our clients via phone and email will be truly missed. But we know that he had an amazing future ahead of him. And now, he will be one of our clients, and we’ll have the privilege of serving him while he serves others in South Africa. We’re sure he’ll sign up 10-15 people on the plane ride over there. Travelers that forgot to get a policy or thought it would take them too long. Thank you, Troy, for the privilege of getting to know you as a person, as a GNI associate, and as a Christian brother! If you ever need it, I will be happy to write an outstanding reference for any future boss on why they should hire you. And if you ever come back to the Phoenix Metro area, please give us first dibs on bringing you back on at GNI, Okay? I have asked Troy to write down some of his thoughts (shown below). I also asked Troy to provide information on how to connect with him as he embarks on his new adventure! I was born and raised up in Chandler, Arizona, where I am still living. A few years ago, things were rearranged in my life and I wanted a change. I moved out of state for about six months, and moved back to Arizona in January of 2012. While there I was looking for work, starting to get on my feet for the third time, looking for a “steady” job. I was a young man, very young in my faith, and still had a “teenager” mentality (The kind of mentality where you think you know a whole lot about a whole lot of things.). I had an inconsistent personal life and I was chaotic in taking care o f my responsibilities. Pride was prevalent when I thought I was humble, and while I knew how to conduct myself, I was also decently hard headed. Overall, I was unsteady as a person because I hadn’t really gotten grounded – Things were sketchy, but I went along with it like it was all good. Coming into GNI, I was feeling very thankful that I was blessed with a great job and a great “family” to work with. I quickly started to grow up, due to the new position and all the responsibility given me. 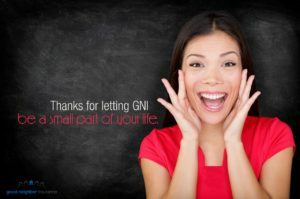 GNI operates in a very personal and cohesive manner. I’ve begun to understand so many indispensable things about life, people, God, and myself. a. Time is precious, but it can easily be wasted. With regard to business or ministry or education, I began learning that taking time to be actively “doing” is often more beneficial than intending, planning, or talking about what should be done. Eliminate what doesn’t matter and focus on the job at hand. b. It is far better to reject yourself, and focus on honoring others. This is a naturally hard thing to do, but it is so important to building strong relationships. In doing so, you make friends for life. c. Always add “value to people” by serving them the best you can – Second-mile service. People you serve and those who serve you need someone to sincerely care for their state of being. These can be clients, coworkers, business partners, friends, and family. d. A real genuine person is a treasure of a friendship. The people who make up GNI are sincere in their actions and words. It is a good thing for someone to be real in who they are, rather than compromising because of one or more persons. Or “tell people what they want to hear.” Or take shortcuts. I see this now because I am learning this, having had a real “hands above the table” relationship with real professionals and mature adults. e. Pushing each other in a difficult, but healthy direction is simply amazing. 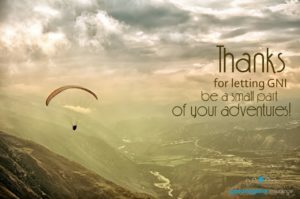 It is not always easy for the “pusher” or “the pushed,” but it is something to truly appreciate for the whole of your life. We need people to push us, challenge us, believe more about us than we maybe think we are capable of! After starting work, I was considering if this career I started was what I wanted to do for the rest of my life. Therefore I sought the Lord to try to understand why I was feeling this way and learn His will for me. It definitely wasn’t because I didn’t like my job, because I truly believe GNI is one of the best jobs to work at in all the earth, but there was a distinct burden causing these thoughts inside me. Well, an answer was given! On September 19, 2014, I will be starting a new direction for the rest of my life, beginning with a discipleship ministry called YWAM (Youth With A Mission), a non-profit international organization. My first destination is South Africa at YWAM Muizenberg! I will be part of a Discipleship Training School (DTS) which will provide college credits and open doors to education and ministry opportunities around the world. I will have a lecture phase for three months and then an outreach phase for over two months. Overall, by God’s grace, I will be preaching the gospel of the Kingdom of God through my words and actions. I am incredibly thankful, stoked, and have immense peace with this decision. I will start in Cape Town, South Africa. While initially overseas for about six months, I will be traveling to one or more places. If you would like to contact me about anything, please do! I’d love to have your friendship and support. Below is my contact information. Mail takes a while (do people still use ‘mail? !’), so email first and I can send you my physical address.